Your ATMega328 microcontroller comes pre-programmed, but perhaps you’d like to dive into Mark Wilson’s open-source code and do your own modifications. First, you’ll want to install the Arduino IDE (I’m sure you already have this if you’re actually thinking about modifying the code.) The source code for the µKenbak-1 is available here. You’re probably used to plugging into an Arduino and uploading the code, but there is no Arduino inside this project. 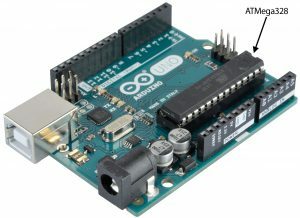 There are other ways to upload the code using a programmer (I’ll leave that up to you) but the easiest way is to simply remove the ATMega328 chip from the µKenbak-1 and replace the ATMega328 chip in an Arduino Uno, then upload like usual. Pop that chip out when done and put it back in the µKenbak-1.